Under the patronage of H.E. Sheikh Tahnoun bin Mohammed Al Nahyan, and thanks to the foresight of the Abu Dhabi Concert Committee, the 6 th annual Al Ain Classical Music Festival was successful, enjoyable, and way over the top. Thirty-eight members of The Vienna Chamber Orchestra entertained well over one thousand guests in the Jahili Fort on March 8 & 9. The music and life of Mozart were skillfully presented by Joji Hattori, their Associate Conductor . The ENHG was proud to participate in the event and provided guests with opportunities to visit seven different sites-of-interest in the Al Ain area on both Thursday and Friday mornings. 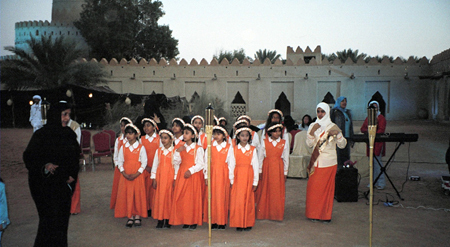 The Hanging Gardens of Jebel Qatara, always popular, and Jebel Hafeet tombs were top destinations. Hopefully, as we gain experience, our contribution to this event will grow even more. Fifty-six guests took one of seven tours offered on both Thursday and Friday mornings. They visited Wadi Afrathe, the Jebel Hafit tombs, Mezyad fort, the Hanging Gardens of Jebel Qatara, Wadi Aboul, Al Jimi oasis and Afrathe. This year, for the first time, 4 x 4s were used to transport guests in to the more inaccessible sites. The consensus was that this was a great improvement on the previous bus system and hopefully will be expanded next year. The group may also offer afternoon tours next year, especially if morning concerts are scheduled. The highlight of the weekend came when three of the musicians approached the group requesting an after-concert tour. The ENHG responded by taking seventeen musicians on the Kaal to Sharm drive beginning shortly after 2:00 pm. This drive more than any other takes the visitor through a greater variety of landscapes and into more archeological sites than other developed tours. We first stopped off at a rock formation which clearly shows the folding and faulting that took place millions of years ago over so much of the region. This is followed by a stop in a sand bowl where camels take dust and mud baths. The edge of the desert where rock and sand meet is always interesting. A local camel herder stopped by and offered camel rides. Next came the drive through the sand dunes to a small area where fossils are quite plentiful. Many excellent samples were found. More driving and we stopped to photograph some dune-side camels, then on into wadi Sharm. 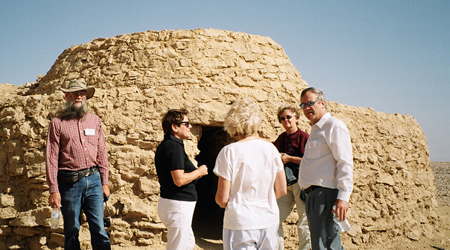 Here the old fort and old stone hole-in-the-ground homes (bayt khaima) really impressed the group. The beauty of the oasis was more starkly contrasts to the rocky /sandy surroundings. Finally, sun setting, the group drove back through Mahda and returned the musicians to the Hilton hotel where they stayed until 5:00 am the next morning. This was the best way we could think of to repay the musicians for the pleasure of listening to them perform the 200+year-old music written by one of the most outstanding musicians of all time. The most amazing aspect of Mozart’s music being that he could compose an entire symphony in his head and then write it all down in one day – let alone that he wrote his first real symphony at the age of 8! This broadsheet is published free to families in the Al Ain area. If you are a member planning an activity with a natural history theme please notify us so that others can join you. Everybody is able to contribute to ENHG and Emirates recordings. For more on our activities please visit our website www.enhg.org or join our e-mail discussion group at enhg@yahoogroups.com. The Group meets at 7.30pm on the 2nd & 4th Tuesday of the month, usually at the Intercontinental Hotel. New Members are welcome. 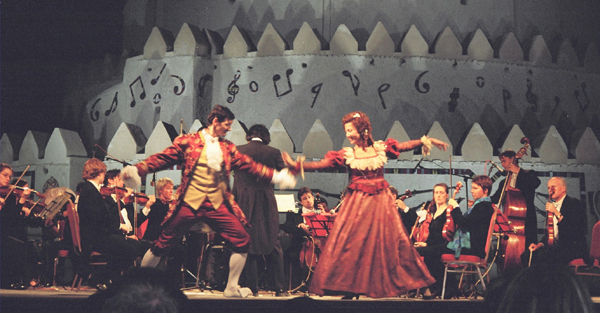 The dancers – the music – the fort – incredible! The ENHG would like to thank all those who participated as volunteers in making this weekend a successful event. Let’s do it again next year! 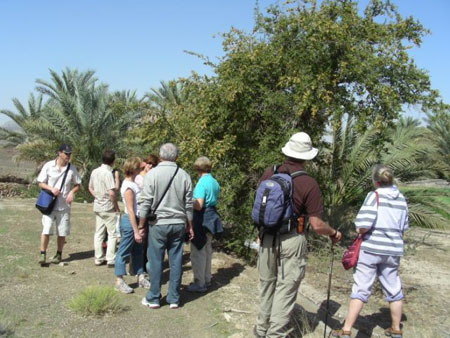 On our walk to the Khutwah Oasis this month we found a few common plants that you will be able to view in most of the walks in and out of Buraimi area. The Sodom’s apple is a perennial shrub or tree (250-500cm) that is found around the UAE. It has a woody base with a rough patchy main stem, with round to ovoid pale green woolly leaves. It excretes sticky white latex when broken. But what is so remarkable, are the beautiful pink flowers found on stalks 1.5 m high. It ranges from a pale pink to a darker pink. The fruit is smooth and green. It is a perennial with fronds up to 30 cm, they have rooting parts with brown scales. 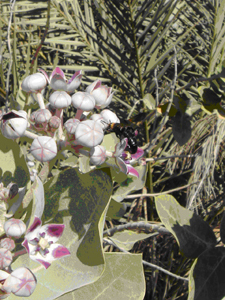 The stems are leafless, with variations of colors, brown to black. 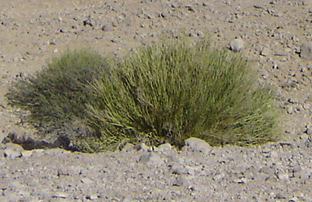 The leaves are oval with divided lobed leaflets. 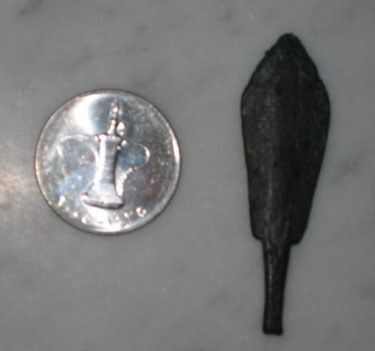 Spore cases are found on the outer edges. They have the same habitat as the helloborine orchid. 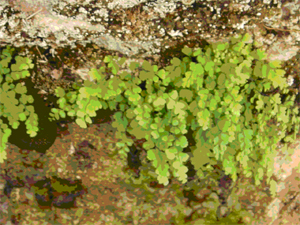 The maidenhair fern infusions are used for chest diseases, to induce vomiting and to treat obstructions of the liver and spleen. 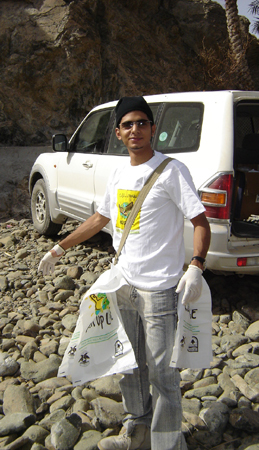 Their habitats are gravel plains and mountain slopes up to 1300m, in the Hajar Mountains and Ru’us al Jibal. Common uses for the plants are thatching of roofs, latex for bird catching, poisoning of fish with plant’s sap. When the plant dies it forms a circle of branches. 1. Poor preparation and planning. Having been in, or close to deserts operationally for most of a decade in the Oman Army and having owned my own camel company I think I have a reasonable idea of what the topic involves. I also have 10 years experience in The Royal Marines. Much of that was spent in another type of desert environment; The Arctic. I have the utmost respect for the desert and for the plant and animal life that clings to it. To this end I would ask everyone to take care with its finite resources and to leave it in as good a condition as when you entered it. Please take all rubbish with you and any that you see if that’s possible. 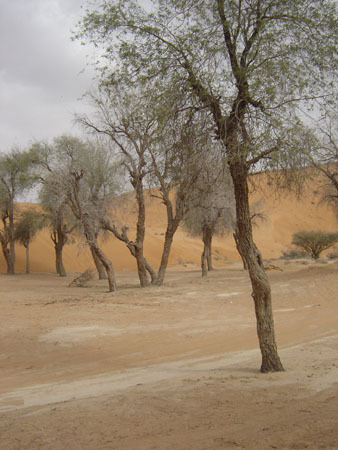 Al Ain is on the edge of a huge and dangerous desert; The Empty Quarter or Rub Al Qali. In summer temperatures reach a brain fuddling, searing, 55 plus, though it can get cold at night in winter. 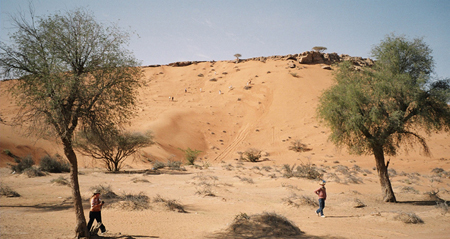 The desert however is a beautiful place in which to drive, camp and explore provided you take some basic precautions. Sand is extremely abrasive: it gets into machinery wrecks your camera and high tech, ruins optics and gets in your hair and up your nose. Sand is ok on a windless day but turns nasty with a moderate breeze and is hell in a strong one. Sand heats up and heats up; the surface is hot enough to cook food in the summer however deeper down it is cool. In areas of constant wind it forms dunes and in some areas these are like small mountains. Sand is like snow forming cornices and drifts; it is more solid in the morning and in the evening and night when it forms a crust on which driving is a lot easier. It becomes very powdery and soft and very difficult after about 11:00 am after the sun dries it of any surface dew moisture. When it is ground up by many vehicles ploughing through, the grains become smaller and a deep powdery track can become very difficult to negotiate like driving through flour. Driving is best done when the surface is firmer so you could consider stopping about midday, get into shade and carry on around 5 pm. For a “normal” day excursion I would suggest commencing about 6 am and drive to midday then withdraw or camp up. 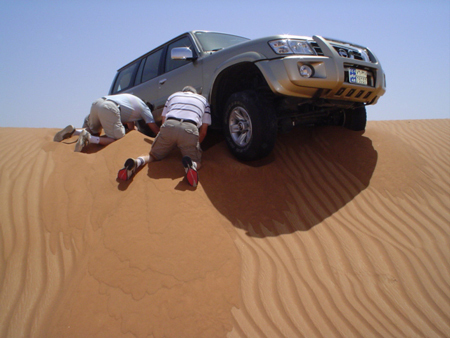 If you are in the desert dunes after about 1am you will probably get stuck…in fact you will get stuck. You should get stuck then you will learn how to get unstuck! The simplest technique to improve traction in soft sand is let some air out of each tyre. Two minutes worth is about enough. The rest has to be learned and done behind the wheel beside a good teacher! A small note about swampland in the desert: Sabka or bog is very unpleasant to get stuck in. In summer, areas of lowland which appear as salty white regions but which fed with winter rain are some of the most dangerous areas in the world have been known to swallow vehicles and camels without trace. quite rare but should be avoided in all seasons. Luxury if you have a satellite navigation system and a com-pass and map. If you don’t, remember that this is the northern hemisphere so a number of things are standard. in the east and sets in the west. At mid day it is at its zenith in the sky and exactly due south. Ok drop a line from the sun at midday and a line from you to that point on the horizon is due south…so its easy to fix the opposite direction North and to find East and West. The moon loops flatter in the sky and it rises also in the east and sets in the west. Finding south is easy from a crescent moon as you simply join the points up and project that line to the horizon…that’s south near enough. Naturally this is dead basic and the other methods using a watch and thirdly the shadow cast from a stick in the ground and star navigation are techniques you should learn in practice, not from a book…as are the fascinating modern techniques with a satellite navigation system - all includable in the courses I’m hollering about at the end. Water, or the lack of it, is the big killer. The only thing that works in deserts on the water thing is take your own and take plenty. In the army, we planned on 5 gallons a man drinking water per day. That is a full jerry can each for every day! For anyone who has done arduous training in 55 degrees plus they will tell you…“you just keep pouring it in.” Don’t be measly with it; this is not the Alamo: drink enough, but at the same time don’t waste a drop. It’s a sad fact that people have been found dead in deserts with water still in their canteens. …In addition to this required load, we all carried over and above that 4 or 5 full one pint water bottles. You may need to supplement your potassium supplies as pouring in gallons of water you may start to go deficient after a few days. The best way is either with dioralite additive sachets you can buy at the chemist or what I like better is flat, repeat flat, 7-Up or Sprite; so pop a half dozen tins of pop in the coolbox! What you should realize is that no one ever died in the desert from lack of food. Most of us have about 2 weeks worth, or more, between our neck and knees. The vital stuff is water. No – you don’t find this out there waiting for you! Forget solar stills and fancy gadgets; they don’t work! I have built 10 or more solar stills and never got a drop from any…I did get damned tired though, digging a flaming great hole each time! Another myth about finding water in the desert is digging for it… .you would need a mechanical shovel and a months digging down 30 to 50 feet or more….i.e. you would die exhausted shoveling soft sand at about 5 feet …but it is true that you are seldom more than 50 feet away from water in the desert…but it's straight down. Another no-no, unless you happen to be a plantologist, is chomping the vegetation…licking stones or swallowing that green gunge camels regurgitate occasionally. I also tried the clever Bedouin ruse of following bees!…apparently bees fly towards water, collect it, then fly back to the bees' nest….after about 20 kilometres I gave up, the bees vanished and I never saw any water. So the fact is; you must take sufficient water with you. Miss this fact and you could die. It takes at least an hour to gear up a 4x4 vehicle, including checking and topping up everything, loading and securing all stores. It is obvious that two or more 4x4 vehicles fully serviced and topped up with oil, fuel and radiator water are the basic vital requirements. It also ought to be obvious that a map and a compass should be along for the ride and a satellite navigation system if you are serious. It’s a good idea to have a mobile phone, but be advised they don’t work everywhere, and for anything that uses batteries, you will need recharging facilities and or spare batteries. Ok so far so good; this is not rocket science. 2. Technology: Nav Gear, compass, Map, Sat Nav Communications plus batteries and recharging gear. 3. You will probably get stuck…take a shovel - at least one per wagon. 5. Take the spigots and bolts you need to attach the rope to each vehicle. 6. Complete Wheel Jack and a couple of 2 foot long wooden planks are useful to shove under the tyres when stuck or to support the wheel jack. 8. Take a couple of lighters and a big box of matches so you can make a fire - so you don’t need to do the boy scout stick rubbing thing. 9. Jerry can or cans of spare vehicle Fuel. Spare engine oil. 10. Vehicle tool box to include spare fuses, hand held tyre pressure gauge and the usual spanners and spares. 14. Fancy gear worth taking includes folding chairs and table…You don’t need a tent. You might want to take a flysheet or awning to attach between vehicles when you stop to act as a sun shade. Oh, and a big luxury this one a collapsible canvass shower…any daft person can be uncomfortable… they use amazingly little water …its great after a dusty day getting to your desert base camp. You need a basic ground mat, inflatable or otherwise and either a lightweight sleeping bag or a blanket whichever you prefer. Once again I emphasise - sufficient full water containers and one for vehicle fuel clearly marked. Let someone responsible know where you will be going and write it down for them so they can refer to it later. Put your route on there and your contact mobile phone numbers and the people who are with your group. Don’t forget to call them when you return. I will not dwell on this worst case scenario but in a catastrophic situation finding yourself in a single vehicle totally stranded and broken down with very little assets, no phone etc. Brew up. Get your pencil out and scribble some ideas down - start plotting your recovery. If you don’t have a pencil scribe it with a knife or twig on a flat area of sand. The headings you need to get your head around are Water, Shelter, Warmth, Signals and lastly food. Consider a plan of action. If you do break down catastrophically and you find yourself on your own, the book says stay with the vehicle. So lets see… If you stay put there is a lot you can do to get noticed… A fire is excellent as it attracts search parties at night and if you burn any old rubbery stuff during the day you can set up a wonderful tower of easy to spot smoke. The car seats, the spare, since the vehicle is totally broken you aren’t likely to need it….and anything else you can get hold of…green plants give off a lot of smoke too…. The catch-phrase is “Tower of smoke in the day, beacon of light at night”. The other clever thing to do is hang, drape, tie anything you can find which shines in the sun. ”The Christmas tree effect”. The turn out for this trip was quite small, as most ENHGers were in Ras Al Khaima this weekend, but there was a good number anyways! We started as usual at the Buraimi Hotel battling with the flies, but then decided on our destination point as Wadi Sharm. Off we went with only Brien and Nasser driving, and stopped at a few different places first. Stop one was a nice sand dune where the camels like to take sandy bathes and where one old-growth forest of Ghaff trees grows. It had just rained 2 or 3 days previous, so there was a nice blanket of green on the sand too. Then we moseyed our way on to a grove with some good fossil hunting in it. Mostly we found uni-valves and corals, but a few unicorn snails and such were collected too. Brien also showed us a beautiful purple flower tree that is of the milk vetch type, and grows almost everywhere in the desert and out my window as well. searching to find the first one, after many bits and pieces of old pots and plates and the like were found first, but we did it, we found an arrow head. It was definitely a lot harder than it should seem! But, there it was, in the middle of someone else’s footsteps, who had walked right over it, but I found it! It’s no more than 1000 years old, and made of bronze, but it’s about 3 inches long, and still good and solid. So the guys were all a bit jealous of a woman finding the coveted arrow head instead of a cooking pot, but that’s ok with me! I’ll be happy to take it in to the museum for proper archiving, and if they really want me to look after it, I surely will! Definitely some interesting pieces out there if you’re into pottery and a great camping site if you’re a weekend adventurer! I plan on going back to do just that! So, after a few great finds, and getting totally sunburned on my neck, we headed off back home stinking and tired, but satisfied (most of us!) and in desperate need of showers! All in all, a good day. Off it was again early, early today. That’s something I’m going to have to get used to, is waking up early on Friday mornings, and going on only one cup of coffee! I will do it for the fun times I’ve already had getting up that early! There was a good crowd this morning, I think 5 trucks left today, so not bad for the clean up effort. So away we went down the main road in Buraimi (as I’ve heard there are only 2) for about 30 minutes, then a left turn into the desert, and that’s about as much as I can tell you for directions to this place! I really don’t know how the guides remember these things, but I guess if you’ve been going there for a while it sticks after a bit. 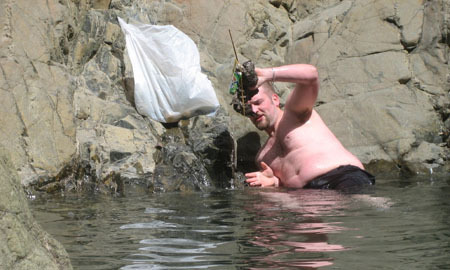 So up the wadi we go, after the desert road, and stop just at the foot of a small pond/river. With a beautiful oasis around this particular area, I can see why it’s so popular to go there and have a bite to eat, or just a nice time with friends…… I hope to go back sometime to do that. However, it was a much needed clean up today, but also really fun. After climbing your way to the biggest pool at the bottom and passing many that were so full of calcium they were absolutely white with it, there was a wall of rock that needed to be climbed, or you were gonna be left behind! Myself and a few other ladies stood at the base, hoping that teleportation would get us to the top, and realizing that wasn’t going to happen took a deep breath and started up. I’m not so good with rock climbing as such, but the ascent is ok, it’s the descent part I don’t like so much. But we all made it, and nothing was broken or bruised or anything, so we were quite proud of ourselves! After the climb, you walk into this gully with a beautiful waterfall coming into the main pool at the top. . Again, a beautiful place to go have a nice day with special people, and used quite a bit. So the guys had made it up there first and were already in clean up mode, and what a satisfying thing to have done today. Of course they used the clean up as an excuse to jump into the water and get right under the falls, but they did a great job getting the muck out of the pool, so it was a win - win situation. It’s a nice shaded area, with some good spots for just relaxing. And it’s for the most part secluded except for the way in, or from above, but very quiet and cool with a nice breeze coming in every so often. So, nose to the grindstone, it was a clean up mission for most and I ended up being saved by the glove I was given to use from touching some pretty nasty things, so thanks for that. And it was a good haul today. 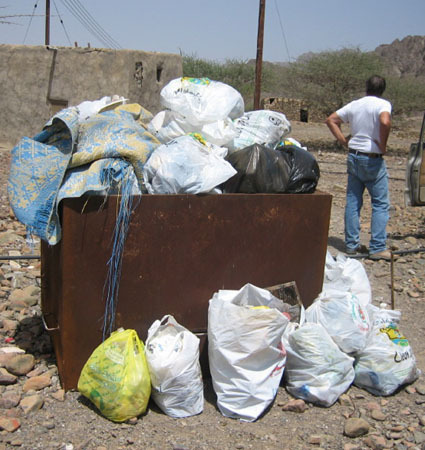 I think we got 28 or 30 bags total of garbage out of the area, and we had a great time doing it. No sunburn for me this weekend, and I even got a cool shirt out of the deal. 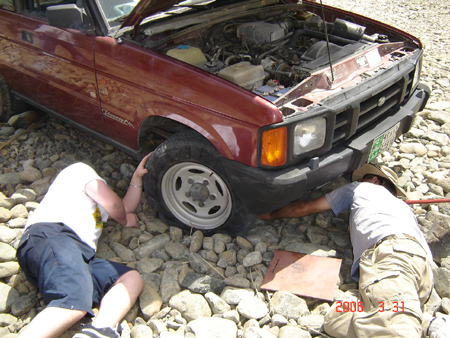 Thanks Jerry for being the guide in this, and for helping us change the blown tire at the end of it all! What a topper, but the ENHGers did help quite a bit with that one, and it was a BLOWN tire with no hope of going anywhere till it was changed! We even had a bit of background music from Brien’s truck to add to the ambiance! Another great day, and I’m sure there’ll be many more, even with the blown tire, but hopefully not ours, nor anyone else’s in the group next time! Hey! This tire's only flat on the bottom! The trip to the cultivations near Afrathe was enjoyed by nine guests of the music festival including three musicians. The tour was let by Steve Ehrenberg and Bob Reimer. Steve explained the tufa formations and pointed out its use as a building material, particularly in the terrace walls and fences. Later in the tour, Steve checked the composition of the tufa with his handy-dandy geologist's flask of hydrochloric acid. Steve positted that the area would be light in calcium therefore the tufa would be mainly mangnesium compounds. Much to his chagrin, the acid frothed indicating calcium compounds. The oasis was in a good state as dates were being pollinated, limes and mangoes were in bloom and sidr and pomegranates were in fruit with one sidr being particularly heavily laden. There were also many onions and herbs growing. A major surprise was a large grape arbour. Butterflies, wasps and beetles were spotted by a number in the group. The faunal highlight of the trip had to be the male Sinai Agama ( Pseudotrapelus sinaitus ) in its distinctive powder blue mating display, spotted by Martyn Thornington. The lizard was basking on the tufa and posed for many pictures. 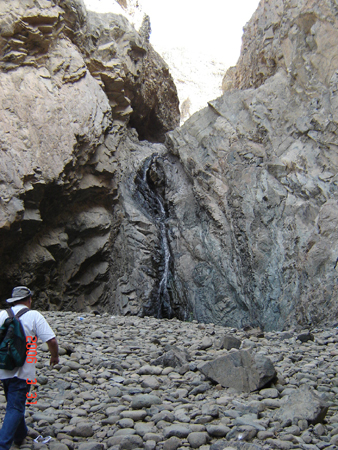 The group was fascinated by the springs that fed the oasis and the tiny channels that guides water to the settling ponds. The tour finished with exam-ining the structure of the ruined homes to the north end of the area. Some of the bait khaimah have rock peaks on the back wall reducing the need for poles in the construction. When planning the trip, I was worried if we would have enough to do to fill 3 hours. As it turned out, we rushed through the last few features and still were late back to the hotel. I think everyone enjoyed the tour of the oasis and its many interesting features. The Jebel Shams campground has quoted me a rate if 15 Riyals per night for one cabin (their usual these days is to ask for 15 R per person per night – includes dinner and breakfast) so we will have to take our own food and drink up if we want this rate! No more than 3 people per cabin please unless you are a family unit. This would be for the Wednesday night, April 19. Thursday night will be in Nizwa. We always do our best to travel at appropriate speeds - if we don’t know you have a problem, how can we adjust for it? 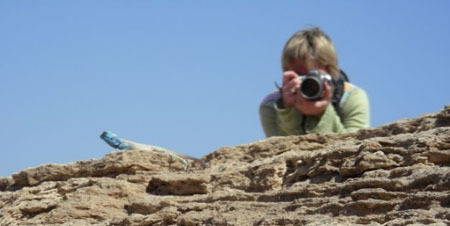 It is now one month away from the deadline for entries for our Spring 2006 Photography Contest (May 9th). Rules and a entry label template are posted at http://www.enhg.org/admin/photo.htm. You must be a member to enter, so if you haven't renewed your membership, Tuesday would be a good day to do it! Remember that the special category this year is "Motion." You may chose to interpret "Motion" in any way. Be careful with your cropping of images. This is the judges' key piece of advice each year. You can use normal digital techniques to enhance your photograph just as you could manipulate a photo in the darkroom. Any obvious cloning though may detract from your photo. If you are submitting entries from digital cameras, I'd appreciate also receiving a file with your entry so that your submission can be shown at its best in the PowerPoint presentation. Remember you don't have to wait a month to submit! One of the photography blogs I follow had a pointer recently to the the winners of "Pictures of the Year International." You may want to check out the Natural History categories for inspiration.